It’s been a painful year to be a diversified investor and to own anything other than U.S. stocks. The third quarter was no exception. U.S. stocks, as measured by the S&P 500, were up 7%, while developed international markets returned a meager 1% and emerging markets ticked down 1%. High-quality, short-term bonds were flat for the quarter. Globally, economic activity continued to strengthen, with U.S. GDP up an eye-popping 4.1% on an annualized basis. In the U.S., the Consumer Price Index increased 2.7% for the twelve months ending in August, and the Federal Reserve raised its overnight target to 2.25, a quarter-point hike. U.S. markets have benefited from a strong economy, while mostly shrugging off concerns about the impact of a trade war and rising interest rates. Conversely, international stocks, when denominated in U.S. dollars, have been hindered by the dollar’s strength and, to some degree, by concerns around a U.S.-initiated trade war. Countries in Europe, including Italy and the U.K. saw continuing political uncertainty around various issues – debt in the case of Italy and the seemingly unresolvable Brexit issue in the U.K. There were some encouraging signs on the trade-front with the signing of a U.S.-Korea trade-deal and the renegotiation of a “new” North American trade deal that apparently, under no circumstances, will be called “NAFTA 2.0.” Trade tensions continue to escalate, however, with our largest trading partner, China, as the U.S. levied tariffs on $50 billion worth of Chinese imports and threatened additional tariffs on $267 billion worth of other goods. 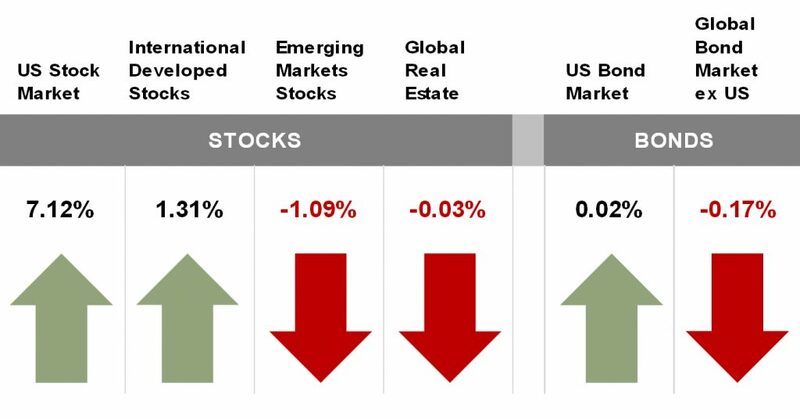 Despite the robust performance in the U.S., ours wasn’t the only strong-performing market. Japan, for example, was up 8% for the quarter, while Norway, Switzerland, and Mexico were all on par with U.S. returns; however, the overall trend for non-U.S. markets was weak with with the MSCI All Country World Index, excluding U.S. holdings, up only 1.31% for the quarter. Making life even more painful for any reasonably diversified investor has been the relative outperformance of not just U.S. holdings, but specifically, U.S. large growth holdings. For example, the S&P 500, which at its core is a large growth index, has outperformed international holdings by more than 6% per year over the last decade, but it has also outperformed U.S. large value type holdings by 3% per year over the same time frame, and outperformed U.S. small cap holdings by about 2% per year. This outperformance by U.S. large growth hasn’t always been the case, and likely won’t be forever, but never-the-less, that is the story we’ve seen this year and for many of the last ten. Given the U.S. market’s strong relative performance compared to most everything else, you might ask yourself, “Why would any sane investor want to own anything other than U.S. large growth-type holdings?” It seems like a hard question to answer considering recent U.S. performance but becomes much easier to answer in light of history. To wit, there have been many market periods throughout history where the story was reversed, and the question was exactly the opposite: why would any sane person want to ever own U.S. stocks again? Examples include the 1970s, early 1980s, and the first half of the 2000s, all periods when U.S. holdings were among the worst on the planet. For example, from 1977 through 1986, international stocks outperformed the U.S. by an average of 6.2% per year, about the same margin by which U.S. stocks have outperformed internationals over the last decade. More recently, from 1998 through 2007, U.S. stocks again lagged the rest of the world by a little more than 3% per year. While it seems hard to imagine that international markets could ever again outperform those in the U.S., it’s becoming increasingly likely given comparative stock market valuations. The S&P 500’s cyclically adjusted, 10-year price-to-earnings, or CAPE rate, ratio is currently at 33, according to Yale University’s Robert Shiller. This is the highest that ratio has been since 1881—except for the late 1990s at the height of the “dot com” bubble. Looking at more current one-year trailing valuation ratios, the U.S. is still quite expensive, trading at valuations that are between 30% and 100% higher than non-U.S. markets, depending on the valuation metrics used and the markets you’re comparing to. In setting expectations for forward-looking returns, low valuations are your friend; high valuations are not. Being a disciplined investor is hard, and there are times like this when being diversified feels like everyone else has been having a party without you. However, all other things being equal, a portfolio that delivers a smoother ride—lows that aren’t as low and highs that aren’t as high—and avoiding entirely lost decades like the 1970s and early 2000s can help avoid the hangovers that too often follow such parties. Being a disciplined, well-diversified, and patient investor while maintaining reasonable return expectations relative to your plan and portfolio is likely to produce a better retirement outcome… and fewer sleepless nights along the way. And, ultimately, that’s what the party’s all about. As always, please don’t hesitate to reach out if there is anything we can do for you or if you would like to discuss your specific situation. That’s what we’re here for.